I’m a big fan of good jerky. Do you find that it is typically a ‘guy’ thing to eat jerky? For whatever reason it seems that I rarely see a woman get excited to tear into a bag of jerky, but when a guy sees that jerky is available well then it seems like it is a whole different ball game. I know from my experience that seems to be the case, and hence why I tend to make my own. I just think that when looking at the cost, and ingredients for that matter, that jerky can be expensive. Not only that but I do not even know what a lot of those ingredients are in the jerky! Recently there were pork loins on sale and as I was purging one of our large freezers for a good thaw and cleaning, I decided to pull a couple of pork loins out to be used as sandwiches, but then quickly thought of trying out making jerky with the lean pork. Glad I did because this pork loin jerky was money well spent. Let’s get started on this simple pork loin jerky recipe. First start by cutting the pork loin. I like to have mine almost slightly frozen so that it is way easier to slice, and you get really even slices. Mix all of the everything but the pork in a bowl. Mix it really well. I like to use kitchen safe disposable plastic gloves when mixing so if you have them, strap them into place. Make sure all of the pork is completely marinated in the pork, and gently massage if possible. Cover the bowl and place in the refrigerator overnight to marinate, or at least four hours. 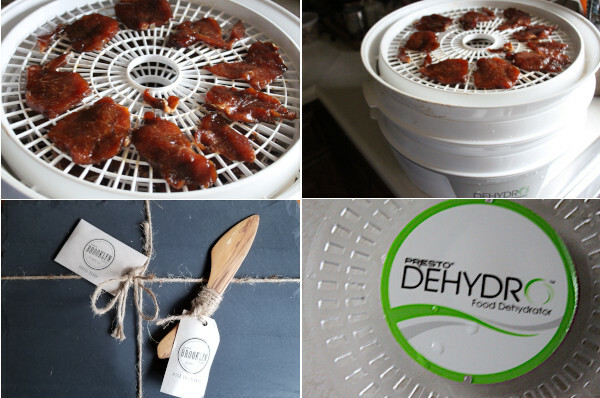 Next is the food dehydrator. Make sure the grates are cleaned and everything is ready to go. take the bottom rack and start laying pieces of the pork around the tray. Keep in mind some dehydrators are different shapes so the racks may be rectangular. If you are baking, Google ‘how to make jerky in the oven’. Do not crowd or overlap any of the pork pieces. Continue with the pork on the remaining dehydrator racks. Stack the racks accordingly, cover, and turn on the dehydrator. For the most part you are done and simply have to wait about 5 hours for the pork to be jerky. Once the jerky is done (it should be completely dry, but not like a shoelace as you still want to be able to easily eat through it), take them off of the rack (they will be slightly hot) and let cool before storing them. Once cooled, I like to keep half and then vacuum seal the rest. I learned the hard way some time ago when making a batch of jerky that when I placed them into a ziplock bag that the moisture got trapped and when pulling some out of the refrigerator, only a couple of days later, they were covered in mold. No bueno. The end result is a really great pork jerky. Heck you would probably not even know it was pork if it wasn’t for the medallion cut! The light smokiness was all due to the liquid smoke, and trust me a little goes a long way. My taste testers came out of their rooms with excitement, and sure enough the pork loin jerky was a hit. The pork jerky makes a great holiday snack and can go well with an array of holiday servings, and in my case cookies and cheese. 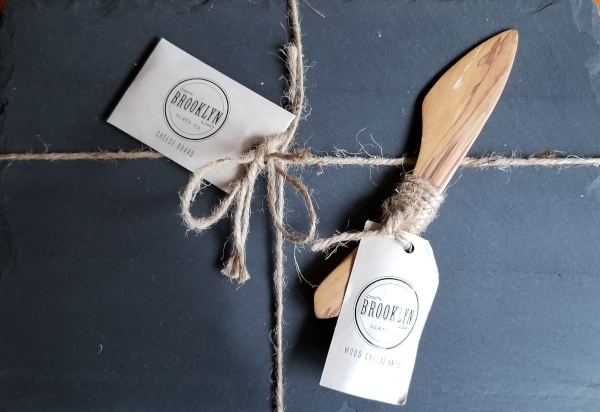 The board I like to serve holiday appetizers on is this slate cheese board from Brooklyn Slate Company (comes with a nice maple cutting knife, chalk, bag, and you can even get it engraved). The cheese board actually elevates the low brow jerky into a more stunning presentation. 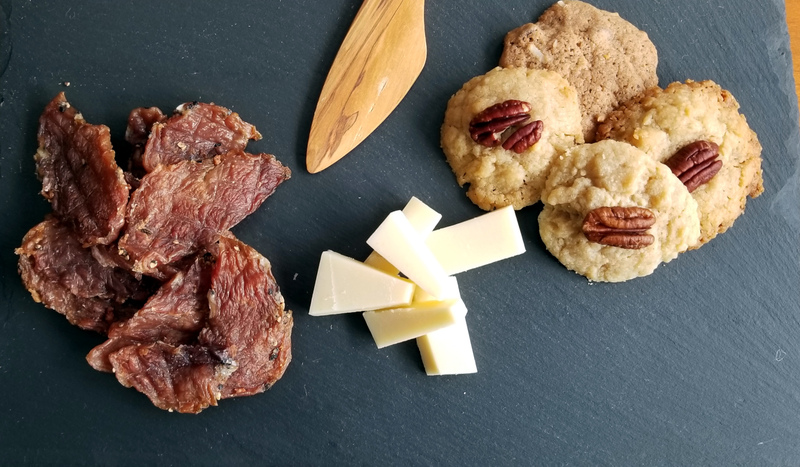 Having the jerky on the board, alongside some funky cheese and some homemade cookies only resulted in a couple of slices of cheese being left, only after minutes of setting it out on display. The slate board that attracted so many quickly became a hit. I did not even get to use the chalk to write little notes on the board such as ‘pork jerky’, ‘manchego’, and ‘pecan pralines’. Next time. There is always next time. Happy holidays everyone (I know it’s early but my schedule is so random nowadays)! If you are looking for a unique appetizer to share, or a great holiday vessel to serve on, give these two a shot. They are both well worth it! That’s awesome Sue! The dehydrator, granted it takes up some space, is a great tool in the kitchen. The pork is lean so it will be a bit more ‘tough’ if you will. Regardless, nothing is ever left when I make it. Good luck and have fun camping! Going to pour rain so I’ll be making this 🙂 All fine. I have a big kitchen so no worries about the dehydrator. I’m wondering if my new mandoline slicer might work for cutting the pork thinly. I don’t have a machine to do it. That’s awesome, Sue. Glad you enjoyed the jerky!